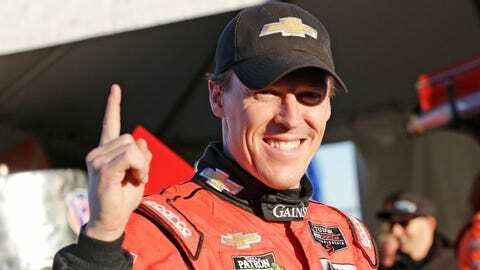 Alex Gurney holds up a finger signify that he won the pole, after qualifying for the IMSA Rolex 24 hour auto race at Daytona International Speedway. DAYTONA BEACH, Fla. (AP) — Facing a season of uncertainty, Alex Gurney and his teammates found some success at a place where they have had little to celebrate the last five years. So it would be fitting if the Rolex 24 at Daytona could turn 2014 around for GAINSCO/Bob Stallings Racing. Gurney was the surprise pole winner Thursday for the prestigious twice-around-the-clock endurance event at Daytona International Speedway that kicks off the racing season. He put the No. 99 Corvette in the top starting spot for the race that begins Saturday with a lap 130.416 mph to easily beat Richard Westbrook, in another Corvette for the Spirit of Daytona team. It was a strong showing for a team that is running on a thin budget, had limited offseason testing and so far plans to run only five of the 13 events in the inaugural TUDOR United SportsCar Championship season. "Maybe there’s a little more pressure on the team, you know, because we know we only have these few chances," Gurney said. "They’re trying really hard. It was a very hard offseason, where everyone worked all the way through. We get bragging rights for a couple of days, I guess. It means a lot to us as a team. We’re only doing the North American endurance rounds, maybe Austin as well, so we want to be able to put our best foot forward and luckily everything came together. It feels really good to be up top." Gurney, whose father, Dan, won the first sports car series race at Daytona in 1962, now hopes to join his father as a former winner of the biggest sports car race in the United States. "It would be the biggest thing in my career," Gurney said. "The last time we had an all-America team was my dad’s team in 1993, all American drivers. For me personally, it’s the biggest race we do. It’s the one we want to win." Dan Gurney won the 24 Hours in 1993 with P.J. Jones, Mark Dismore and Rocky Moran with an all-American team. Alex Gurney will try to do it with Jon Fogarty, Memo Gidley and Darren Law. The odds are stacked against the GAINSCO team: Since 1994 only three pole winners have won the race. And the team has had its struggles at Daytona. Although the team won the pole in 2007 and finished second in 2008, it has finished no better than seventh since and had DNF’s in 2010 and was 89 laps off the pace in 2012. "We’ve been thinking about it for a long time. Every year, we think we have it figured out," Alex Gurney said. "It’s just hard to test for things that are going to break at hour 18 or hour 16, so we’ve tried to address those things over the year, but each time something new crops up. It’s never been speed necessarily that’s been the problem. We’ve always had some sort of mechanical issue that has hurt us. Fingers crossed, we feel prepared and we’re hoping for the best." The Riley DP of Starworks Motorsports qualified third. The Chip Ganassi Racing entries had a tough qualifying session: Scott Dixon qualified sixth in the No. 02 Riley DP, while Scott Pruett was ninth in the defending race winner No. 01. The Ganassi team switched for Ford’s during the offseason and struggled in testing with engine reliability and in Thursday practice with front splitter issues. There are 67 cars in the field spread over four classes in the first year of the merger between Grand-AM and the American Le Mans Series. It marks the first time sports cars in North America have been unified since 1997. CORE autosport was the highest qualifying car in the Prototype Challenge class at 14th overall. SRT Motorsports, which has former IndyCar champion Ryan Hunter-Reay in its lineup, was the highest qualifying car from the GT Le Mans class at 25th overall. Paul Miller Racing was the highest car in the crowded GT Daytona class at 34th overall. That class includes Dempsey Racing, owned by actor and co-driver Patrick Dempsey, which was 46th overall and 13th in its class.